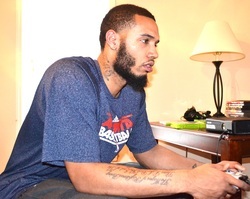 Mike Scott plays one of his favorite XBox games, "Call of Duty." At first glance, Mike Scott appears to be a tall, tattooed basketball player with some intense facial hair. He collects unique socks and debuts a new pair to the world every Saturday via Twitter and Instagram. He’s also both a video game and candy aficionado. But there’s so much more to Mike Scott than meets the eye. His world revolves around two things: basketball and family. Actually, of those aforementioned tattoos, the ones which pay tribute to his parents and little brothers are his favorites. He had a strict upbringing especially due to the fact that his father spent 20 years in the Marines. Twenty-four year old Scott credits this strict upbringing for molding him into the conscious and dedicated young man that he is today. In addition to being a NBA player, he is also a big brother to Antonn, 17, and Derrick, 11. Being a positive role model for his two younger brothers falls into just one of Scott’s many goals. Antonn and Derrick both “try” to play basketball but Scott doesn’t force it upon them. “I was more serious (about basketball) at that age,” notes Scott. At the tender age of four, Scott was introduced to the game of basketball. While he tried his hand at other sports, it was clear that basketball was his destiny. “I was really good at running track…I just liked basketball more. I started focusing more on basketball,” he says. His focus and determination led him to a promising collegiate basketball career. He made the All-ACC first team and shot a league-best 56.3% from the field (averaging 18 PPG) and 80.8% from the charity stripe as a senior at the University of Virginia. No stranger to hard work, Scott dealt with an ankle injury during his senior year of college which he overcame to continue posting up some of the best numbers seen in UVA's basketball history. Among his fond memories of playing as a Wahoo, Scott recalls when he and then teammate, Jontel Evans, grew out their hair for a year until they made the tournament, which they eventually would. When asked if Hawks fans could expect to see that, Scott reassured, "I wouldn't do it again. I had to get my hair braided like two or three times a week." Although Scott has achieved the dream of making it to the NBA, he’s still critical of his own game. As he is considered a "tweener" who can play power and small forward, the biggest challenge with adjusting to the NBA small forward position has been defensively learning how to go around those quicker and smaller players. Scott has shown strength with his ability to score in the paint and draw contact and has a smooth jumper off of the pick-and-pop. Brandon Bass and David West are two players the rookie has compared his playing style to. He’s also already made history. He and John Jenkins became the first pair of rookies in Atlanta Hawks history to each have 20+ points off the bench when they played the San Antonio Spurs this season. Scott achieved back-to-back double-doubles in the Hawks' final contests of the season. His most important lessons learned after his first NBA regular season: "Take care of your body. It's a long season. Just learn from the vets and continue to work hard." It can be easy for a rookie to get in over their head or get lost in the shuffle as they transition from college to the NBA. For Mike Scott, however, it’s all really quite simple. He stays grounded in his family and continues to work hard like he’s done all the way up to this point. He’s ready for the opportunities that await him in the future and he’s also ready to be used in any capacity the team deems necessary. "Whenever my name is called, I just try to be productive,” he says. So far, so good for the Hawks' rookie. 90s shows: "The Fresh Prince of Bel-Air", "Martin", and "The Wayans Bros."